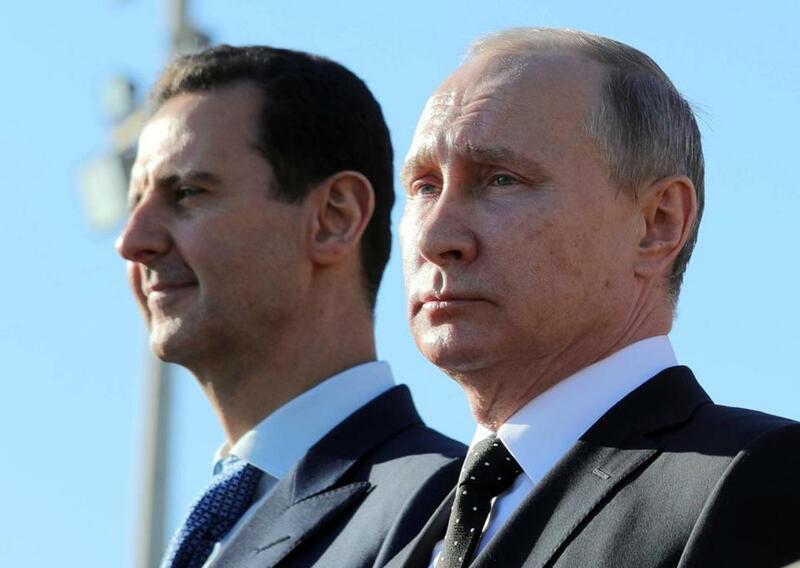 Russian President Vladimir Putin, right, and Syrian President Bashar Assad watch troops march at the Hemeimeem air base in Syria in this Dec. 11, 2017 file photo. MOSCOW — In the Kremlin’s telling, this is a country under siege. At the same time, U.S. sanctions against top Russian business executives wiped billions of dollars off Russian stock market values this week, prompting fears the country’s already stagnant economy could be thrown back into recession. As if to drive the point home, a new article from a top Kremlin aide declared Russia must prepare for a century of ‘‘geopolitical solitude’’ and its ‘‘epic journey toward the West’’ was over. Russian President Vladimir Putin and his supporters have for years been casting their country as one that has to rally around their leader and fight back in the face of an increasingly aggressive West. That ‘‘besieged fortress’’ narrative has now roared back to the forefront in ways not seen since the height of the Ukraine crisis in 2014 and Russia’s internationally denounced annexation of Crimea. The question now is how Russia responds — both to the sanctions and to any U.S. strike in Syria, where Moscow has military forces aiding Assad’s regime. Putin himself has said little on both issues in recent days. He visited Russian scientists on Tuesday and thanked them for their role in helping develop new Russian nuclear weapons. Slides in the Russian stock market this week showed last Friday’s U.S. sanctions represented the Trump Administration’s most damaging move against Moscow so far. The ruble fell to 63 against the dollar, the Russian currency’s weakest level since December 2016, and government officials said they were preparing to take steps to stabilize the Russian businesses affected. ‘‘A blow to any of the groups of companies’’ affected by the sanctions ‘‘is a blow to the economy as a whole,’’ Deputy Prime Minister Arkady Dvorkovich said Tuesday. Sanctioned businessman Oleg Deripaska’s company Rusal, an aluminum giant that employs 62,000 people worldwide, has lost more than half its stock-market value since the sanctions were announced. Sberbank, Russia’s biggest bank, has lost some 15 percent on the stock market this week even though it was not sanctioned. Monday’s more than 8 percent plunge in the benchmark MOEX Russia Index was the worst since March 2014, when Russia annexed Crimea, though the index recovered some of those losses on Tuesday. ‘‘If a very strong sanctions regime spreads to other sectors, this can lead to a financial crisis and certainly a renewed recession,’’ said economist Alexandre Abramov, a financial markets expert at Moscow’s Higher School of Economics. The risk, he said, was that investors would shun all Russian company stocks fearing further sanctions. Even as Russia reeled from the blow to its economy, another crisis was deepening in Syria. The suspected chemical attack in rebel-held Douma brought dire predictions in Moscow that disaster could follow if Washington launches airstrikes in response. Russia denies its Syrian allies used chlorine or other agents in the Saturday attack that claimed dozens of lives. The West says overwhelming evidence points to Assad’s forces - with its backers Russia and Iran sharing responsibility. Russian General Staff chief Gen. Valery Gerasimov claimed last month Russia had information that the United States was planning to fake a chemical attack in Syria and use it as a pretext for a strike on Assad. If such a strike endangered Russian lives, he warned at the time, Russia would respond by hitting the missiles and their launchers. Russia has said that suspected chemical attack in Douma was, indeed, fake -- staged in part to distract from another episode Russia has also described as falsely blaming Russia: the poisoning of former Russian spy Sergei Skripal in England last month. ‘‘The U.S. declared economic war on us, they also declared diplomatic war and everything now indicates that they want to test our armed forces in a local conflict,’’ lawmaker Igor Morozov said on a state TV talk show Monday. Representatives of the Syrian Arab Red Crescent, as well as Russian specialists, have visited the site of the Douma incident ‘‘and found no trace of any use of chemical weapons,’’ Russian Foreign Minister Sergei Lavrov said Tuesday. He said Russia would propose a U.N. Security Council resolution later Tuesday that would call on international experts from the Organization for the Prohibition of Chemical Weapons visit the site, on the invitation of the Syrian government. Syria and Russia, he said, would be prepared to guarantee the inspectors’ security. Amid the fast-moving developments, a longtime architect of Putin’s rule, Kremlin aide Vladislav Surkov, this week published an article in the journal Russia in Global Affairs that presented a theoretical foundation to the estrangement between Russia and the West. ‘‘A new period of unknown length now spreads before us, the ‘14+’ era, in which we face one hundred (two hundred? three hundred?) years of geopolitical solitude,’’ Surkov wrote.